Bellary Raghava was a Telugu and Kannada theatre personality. He was an actor, playwright, and director. 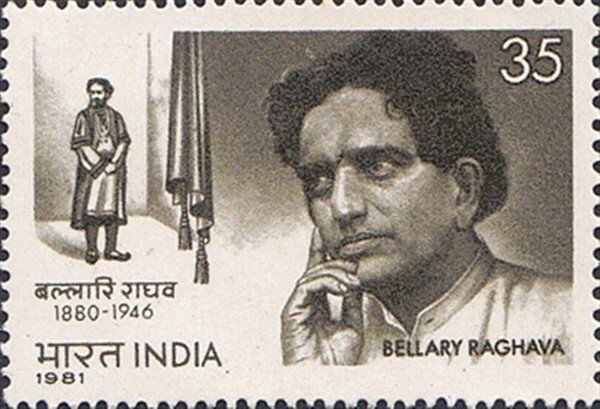 Bellary Raghava was born on the 2nd of August, 1880. He was born into a family that was associated with theatre and his uncle Dharmavaraṃ Rāmakr̥ṣṇamācāryulu was a famous Telugu playwright and actor. Bellary Raghava, whose original name was Tadpatri Raghvacharlu, was a law graduate from the Madras University. He was introduced to the stage by his uncle. Bellary Raghava was a gifted actor whose face and voice were well suited to the stage. He was a versatile performer and was involved in English, Kannada, Telugu and Hindi theatre. He played several roles from Indian mythology and other epics, but he also wanted Indian theatre to focus on current social themes. He founded the Amateur Dramatic Association in Bangalore. He groomed actors to focus less on long drawn out dialogues and more on conveying emotions through expressions and language, in addition to regular dialogues. He also insisted that women should play the female lead, as opposed to the practice of men playing female leads that was prevalent back then. Bellary Raghava was interested in bringing theatrical ideas from other countries to his stage, and he visited London and met famous English theatre personalities like Bernard Shaw, Laurence Olivier and Forbes-Robertson. He staged the play ‘Tappevaridi’ (Whose Fault Is It?) by Rajamannar in Madras. This play was heralded for bringing in a new era in Indian theatre. His foray into cinema was not a success and he was not comfortable with the new medium and returned to the stage. Bellary Raghava was famous for the many memorable roles that he played on the stage. He played the role of Shivaji in Shivaji-Roshanara, Vipranarayana in Prataparudriyam, and Chanakya in Chandragupta. He also took on negative roles like those of Hiranyakashipu in Bhakta Prahalada and the part of the traitor Pathan Rustum in The Fall of Vijayanara. Besides being a versatile actor and writer, Bellary Raghava was also a practicing lawyer and he was a man with a social conscience. He started a night school for Harijans. His speeches on drama and theatre were well received and respected and in these, he emphasized the role of performing arts in building a nation. He advocated formal training for theatre, and insisted that women should be allowed to play the female leads back when women in theatre were frowned upon. He brought in new life into Kannada and Telugu theatre and is still held in great regard for his contributions.